Spending time in your patio is a great way to relieve yourself of stress from a long day’s work. The area can also be where you can host family gatherings. You can improve your experience in your patio further by installing sliding patio doors. 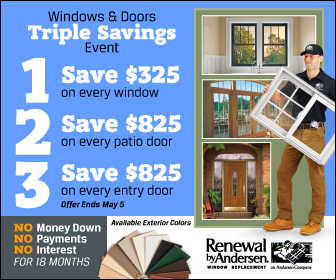 Let Renewal by Andersen® of St. Louis, the expert in sliding patio doors in St. Louis, show you why installing them is ideal. Working on home improvement projects, such as installing sliding patio doors in St. Louis, can bring you closer to your ideal home. Our doors are available in a wide range of interior and exterior colors and finish that will complement your home’s architectural style. We also have a selection of glass grille patterns to personalize your doors further. While our sliding doors do not swing inside or outside like our St. Louis French doors, they do provide you with extra space. This will let you put furniture or artwork in areas where a hinged patio door would normally swing into. Our sliding patio doors feature sleek frames that allow for more glass surface area. This lets you enjoy more sunlight in your home and a bigger view of the outdoors from your living area. In addition, this makes for a smoother transition from inside your home to the outside. We offer sliding doors that feature superior track rollers for ease of use. This will give you a stress-free experience operating them, making your stay in your patio more convenient. Aside from these features, our sliding patio doors come with insulating and low-maintenance properties. Each of our doors is made of beautiful wood covered by aluminum, fiberglass, or vinyl. This means that they will not fade, rot, or blister, reducing the need for maintenance. Furthermore, they feature High-Performance™ Low-E4® glass that can reduce the amount of heat that enters and leaves your home, leading to more energy savings. Lastly, our factory-trained installers will make sure that your doors are airtight, keeping the elements out for lasting comfort. Enjoy these benefits when you choose our sliding doors. Call us today at (314) 332-2364 for more information or for a free estimate.